Roatan Tours-Cruise shore Excursions-Roatan Christopher Tours-Mahogany by Isla Roatan Honduras Tours - Roatan Tours-Cruise shore Excursions-Roatan Christopher Tours-Mahogany by Isla Roatan Honduras Tours. 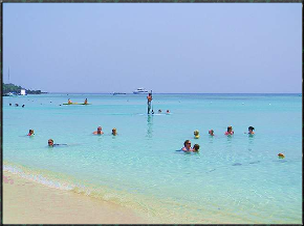 Receive a warm welcome while exploring our website and offering you the best of Roatan tours and cruise ship shore excursions in the beautiful Bay Island of Roatan Honduras.Roatan Christopher Tours provides you with an exceptional Roatan excursion with fun and excitement in each adventure. 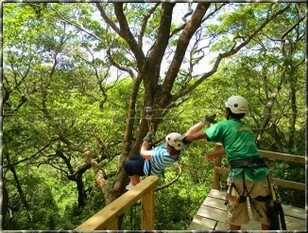 Choose from a wide range of activities that will richly color your vacation and give you a time to remember. 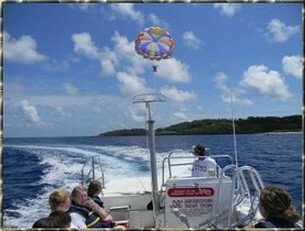 We customize each Roatan cruise excursion around the entire island. You can select from Roatan zip line adventures, the entire Roatan Honduras Tours, Roatan Snorkeling Adventure, Roatan Freestyle tours, Roatan Beach Excursions, Parasailing, Scuba Diving, horseback riding,Eco Jungle walk, sport fishing trips, natural parks, Monkeys, Birds, Iguanas, Shopping, Local Restaurant, and much more that Roatan has to offer. Discover the highlight of roatan and enjoy an spectacular scenery of our island culture during your day, When you meet up with your tour representative at your cruise ship terminal you will be introduced to your English speaking tour guide that will ensure you have a great and unforgettable experience here on Our beautiful island of roatan. What Included? Round trip A.C Vehicle and English speaking tour guide for the day, free entrance to our preservation Monkeys & Sloth Park, Snorkeling trip out to our colorful coral reef and Ship wreck, and a Delicious Island Style lunch. 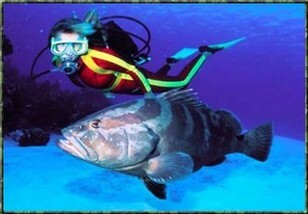 Come and enjoy a wonderful three 3 Stop snorkeling adventure on the beautiful Island of Roatan. You certainly won’t find a more relaxing snorkel adventure location on this beautiful island that is replete with the second largest coral reef in the world and the most protected one in the entire Caribbean. 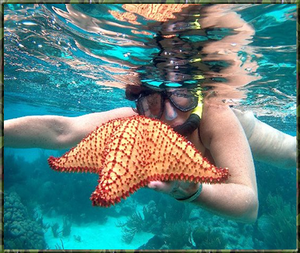 So get ready to Plunge into Roatan's incredible underwater world on a three-stop snorkeling trip that includes exploration of Starfish century, a colorful coral reef and a sunken shipwreck, plus all the equipment you'll need for a fun day in the water. Enjoy a 30-minute drive island tour to the Big Bight snorkel shop at Christopher Tours where you'll meet our team of expert guides and be outfitted with a mask, snorkel, fins and vest. What Included? Round trip A.C transportation from your cruise terminal or hotel resort, all necessary snorkeling equipment, English speaking tour guides, and a Delicious Island Style lunch. Sightseeing culture tour of the island and english speaking tour guide. Nice great island style, lunch at our Beach Palapa Restaurant looking over the ocean: (Garlic shrimps or fried, Coconut rice & beans and fried plantains) or choice of whole fried fish or steamed with green pepper and onions ( Red Snapper), grilled fish steak (Wahoo), grilled chiken breast or island style BBQ grilled chiken. Duration of the excursion: Aproximately 5 hours, with time in spear for your guide to stop along the way for picture taking, stop for souvenir shopping, or you may like to visit our Animal Park: Monkeys, Sloths Macaws, Parrott toucans, and much more. Upon collection from the cruise port, your tour representative at our cruise ship terminal will assist you to your A/C vehicle and English speaking guide. 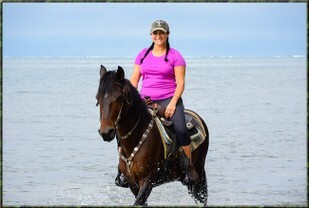 Explore the culture of our beautiful island and combine it with a nice scenic horseback riding tour. When you meet up with your guide at your cruise ship terminal, first you will be starting with a beautiful sightseeing tour of the island introducing you to the culture and history of the island. 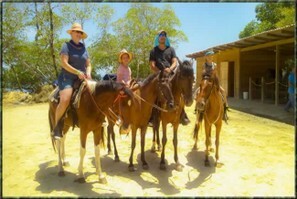 This fun-filled adventurous Best of Roatan tour Package is designed just for you and your group. The fact that you’ll have your own private guide and vehicle for the entire day that you’ll be on our beautiful island makes this an even better proposition. Price : $25.00 P.P from 4 people and up. 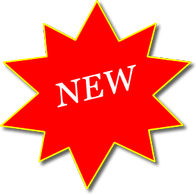 Two People $80.00 P.P, Three People $30.00 P.P. 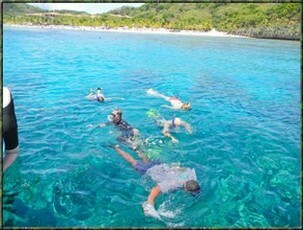 Roatan Freestyle Tour: Is a tour specilly design for cruise ship passengers like you. Arriving at Mahogany Bay Isla Roatan or Island of Roatan Coxen Hole Honduras. As soon as you meet up with us at your cruise terminal we’ll start you off on a wonderful historical tour through the Island of Roatan. While visiting our island there are certainly many exciting activities and things to do during your day. Roatan Zip Line Tour: Explore our beautiful island of Mahogany Bay Isla Roatan Honduras and have a wonderful adventure throughout your day. This tour is designed privately just for you and your group which means that you will have your own private air-conditioned vehicle and tour guide for the entire day that you will be touring the island. 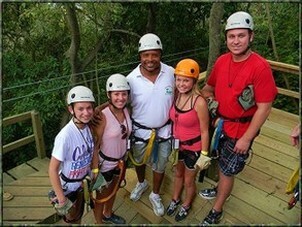 Note: If you are traveling with family members in your group that would just like to tag along for the tour but not do the zip line adventure part of the excursion their cost will be only $25 per person. Come and Have a great unforgettable adventurous tour Combo of Zip line Tour, Horse Back Riding and Snorkeling Adventure, on the Beautiful Island of roatan. As well as all necessary Equipment. 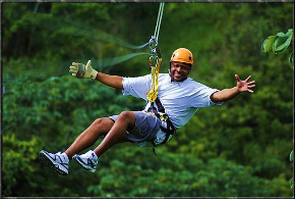 Zip line tour in Roatan: Join other adventurous zip liners from your cruise ship for an unforgettable zip line adventure in the Bay Island of Roatan Honduras, the number one zip line adventure in the western caribbean. 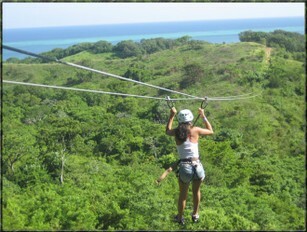 This Isla Roatan zip line canopy tour is for anyone over the age of 5, under 300 lbs, adventurous and in moderate physical condition. so don`t let your age or ability be an obstacle. 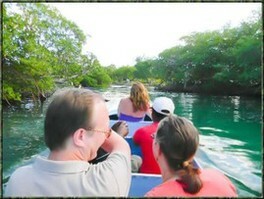 Roatan Island Tour and sightseeing Mangrove Tunnel: Come and explore the culture of Roatan Honduras. When your cruise ship arrives and docks at any port of Roatan and you have met up with us, you will be escorted to your air conditioned tour vehicle and guide, we’ll start you off on a wonderful historical tour through the Island of Roatan. Price $50.00 P.P. 4 people and up. Eco Jungle Walkway Suspension Bridges and beach brake Is an Roatan Shore Excursion specially designed for cruise ship passengers arriving at Mahogany Bay Isla Roatan and Town Center Coxen Hole Roatan Bay Island of Honduras. 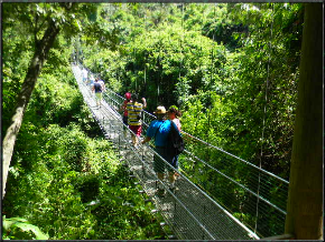 The eco jungle walkway has 8 suspension bridges and makes for a very unique walk through the Isla Roatan jungle rainforest. There are many different species of Roatan Bay Island native animals that you may see during your jungle walkway tour – lookout for iguanas, monkey lala, birds, tropical flowers, fruit trees, nut trees and amazing views. Price: $20.00 P.P from 4 people and up. Come and enjoy a wonderful relaxing day at our beautiful white sand West Bay Tabyana Beach, a breathtaking natural beach that is truly an amazing destination worth visiting. At the beach you will find a variety of beach activities that you are sure to enjoy during your time there. This excursion costs $20 per person depending on the size of your group. The cost will therefore be $35 each for 2 persons, $30 each for 3 persons, and $20 each if it is 4 persons and more. If you have kids under 5 years old the tour transportation service will be freely offered for the kids. Additionally, we’ll be sure to get you back to your ship’s terminal with plenty of time to spare before the cruise ship is scheduled to leave. Tour of Roatan and Glass Bottom Boat, Discover the history of Isla Roatan as you watch the breathtaking landscape that surrounds the area in addition to learning about the local culture of the Roatan Bay Islands. This is by far the world’s second largest coral reef and also the most protected in the entire Caribbean. We’ll definitely be proud to have you become part of our island culture. 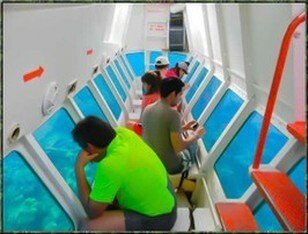 This tour is suitable for people of all ages and non-swimmers will also enjoy it in a completely safe way. 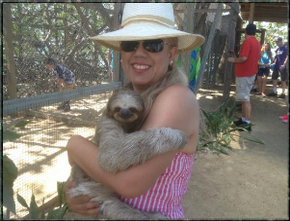 Come have a great time with us on this excursion and make your day in Roatan most memorable. Tour excursion duration 5 hours. 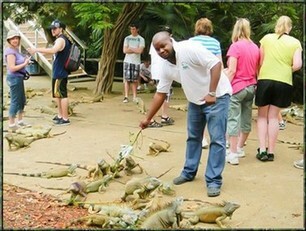 as we continue to give you a nice sightseeing tour that will reveal fascinating aspects of Roatan Island culture. Zip lining adventure and parasailing tour package, enjoy a very nice scenery tour of our island as we make our way for an unforgettable zip line and parasailing adventure, this great and extremely adventurous excursion is certainly an ideal roatan tours for anyone looking to have a fun filled shore excursion in Roatan Honduras. Fun diving trips: Certified divers can enjoy the use and comfort of our dive boat as we visit two different sites at the Roatan Marine Park. Your dive trip will be guided by one of our dive masters and who will help you with your dive equipment and lead you on an underwater tour while pointing out the reef fish and creatures present on Roatan. The price for 2 dives is $110 per person and this fee includes roundtrip transportation from your cruise ship terminal, rental equipment, and the $5 Roatan Marine Park fee. 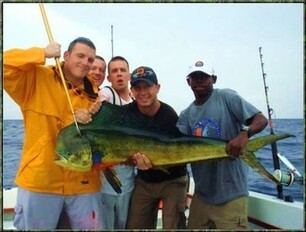 half day fishing charter cost is $480.00 (1-4 people) and this covers roundtrip transportation from your cruise ship, four hours of fishing and 1 one hour for lunch break, equipment, crew, drinks, snacks, fruits and lunch. The full day charter cost is $880.00 (1-4 people) and this covers roundtrip transportation from your cruise ship, eight hours of fishing, equipment, crew, drinks, snacks, fruits and lunch.